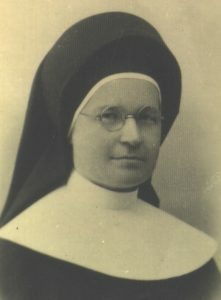 Shortly before her 21st birthday, Ludwika Banas, entered the Congregation of the Sisters of the Holy Family of Nazareth. Ludwika, born April 10, 1896, in Klecza Dolna near Wadowice, Poland, had worked with the Sisters at a hospital in Wadowice. At the time of her entrance into the novitiate, she received the name, Maria Malgorzata. When she professed her final vows, as is the custom in the Congregation, Sister Malgorzata added to her name the mystery of the Sacred Heart of Jesus in Agony in the Garden. Sister’s parents had schooled her in the ways of piety, faith, and love of God above all else. These gifts matured through her religious formation and sustained her in her ministry as a religious. In 1934, Sister Malgorzata was assigned to the convent in Nowogrodek in the eastern part of Poland, where she worked at the local hospital. The Sisters of Nowogrodek suffered through Russian and German occupation of their village, sharing the hardships of the people and depending on their generosity during these times for a place to live. As difficult as life was for the Sisters and the people of Nowogrodek, greater sorrow and sacrifice would be asked of the twelve Sisters who served the people with great dedication and love. On the evening of July 31, 1943, the Gestapo issued an order to Sister Stella that she and all the sisters were to be taken to police headquarters. On the way, they met the twelfth member, Sister Malgorzata, who was returning from work at the hospital and was dressed in lay clothes. Sister Stella told her to return to the house and take care of the priest and the Fara. Sister Malgorzata never saw her sisters again. On August 1, 1943, they were taken to the woods by the Nazis, shot, and buried in a mass grave. In time, Sister Malgorzata, with the help of the villagers, discovered the Sisters’ grave in the woods and committed herself to care for and protect their burial site until such time as the bodies could be brought to the Fara, the parish church,for a proper burial in the parish cemetery. Sister came to believe that as the only survivor, her mission was to look after the people of Nowogrodek and the Fara. During the years of Communism in Nowogrodek, Sister lived in the tiny sacristy of the Fara, and she continued to prepare children for the sacraments. When the parish priest was in hiding for his own safety, Sr. Malgorzata maintained the presence of the Blessed Sacrament in the church, and helped keep the peoples’ faith alive. The townspeople referred to her as the Guardian of the Tabernacle. Sister Malgorzata was heard to say many times, “Spiritual martyrdom is a slow death – that is what I desire”. She died April 26, 1966, and her Cause for Beatification as a spiritual martyr began February 19, 2003. We wait, now, for the miracle needed for her Beatification.